A fish tank is one of the most effective ways to liven up any room and these unique aquariums offer a sense of tranquillity that might not otherwise be possible. However, a good deal of planning needs to take place if you hope to experience a worry-free installation. What are some primary considerations and are there any ways to prepare for the project? Let’s take a look at some expert recommendations as well as why it is always a good idea to procure the services of a professional fish tank installer. Depending upon the type of fish you desire, it is possible to choose a freshwater or a saltwater tank. However, keep in mind that the requirements of a saltwater environment are slightly more demanding. The fish will also require more care. Freshwater tanks are generally more straightforward and those who have never previously owned an aquarium will often choose this option. It is no secret that fish tanks come in a variety of shapes, sizes and dimensions. Choosing the correct one will depend upon several parameters such as the amount of free space, the aesthetic appeal that you are trying to achieve and your budget. If you have a limited amount of floor space, in wall fish tanks can represent excellent options. Not only will they provide the room with a decidedly personalised appeal, but these units can often be made to order so that demanding dimensions can be accommodated. One lesser-known variable that is extremely important involves where the tank will be placed. Keep in mind that aquariums are quite sensitive in terms of temperature fluctuations. This is why they should never be located close to doors or windows (drafts can adversely impact the internal environment). In the same respect, try to place the tank in a location that is not associated with high levels of foot traffic. This is even more pertinent if you have children running about. These tanks can easily become damaged. 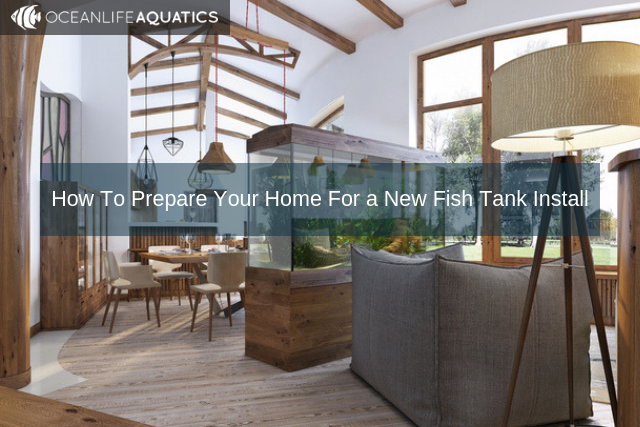 Preparing for a new fish tank installation is a rather straightforward process if you know what issues to take into account beforehand. You will thereafter be able to enjoy all of the relaxing and aesthetic beauty that these units have become known for. Please contact Ocean Life Aquatics if you would like to learn more.